Robert Millikan, Georges Lamaitre, and A. Einstein (with hat). Bob Kurland is a retired, cranky, old physicist, and convert to Catholicism. He shows that there is no contradiction between what science tells us about the world and our Catholic faith. The usual exposition of Einstein’s General Relativity Field Equations is very forbidding, full of Greek subscripts and tensor notation; a clear, simplified version has been given on the web by John Baez, and is appropriate for considering the Big Bang. The standard general relativity model for cosmology is that given by Friedmann-LeMaitre-Robertson-Walker,1 usually designated by FLRW. The FLRW model proceeds from the following simplifying assumptions: a) the universe is isotropic (looks the same in every direction, from every point in space); b) there is a constant amount of matter in the universe; c) on a large scale (hundreds of times the distance between galaxies) the universe has a homogeneous matter density (matter is spread evenly throughout space); d) the effects of “pressure” (from radiation or the vacuum) can be neglected. With these simplifying assumptions, the equation for the “size” of the universe, its radius R, becomes simple, and looks just like the equation of motion for a particle traveling under an inverse square law, like that of gravity. (Note: this is not to say the size of the universe is really given by some value R, but to show how space is expanding; the universe might possibly be infinite—more about that later). The universe might expand and then contract in a “Big Crunch” (like a ball falling back to earth), corresponding to positively curved spacetime (like a sphere); it might expand with a constant velocity of expansion (like a projectile going into orbit), corresponding to flat space-time (like a plane); or it might expand with an accelerating velocity of expansion (like a projectile achieving escape velocity), corresponding to a saddle-shaped curvature of space-time. It should also be emphasized that the FLRW solution to the Einstein General Relativity equations is by no means unique, nor is it the only solution with a singularity. It is a model, however, that is in accord with measured data (red shift, COBE microwave background radiation). The assumptions stated above do not apply rigorously. Observations have shown a filament or bubble-like structure to the universe with clusters and meta-clusters of galaxies. (A theoretical picture for this filament structure has been proposed.) In the early stages of the universe radiation pressure was very likely significant. More recently, measurements have shown that the expansion rate is increasing, which is presumed due to “dark energy”, possibly a pressure due to vacuum energy. Moreover, at some point in the expansion the scale of the universe gets so small that classical physics does not apply and quantum mechanics has to be used for theory. Unfortunately, quantum mechanics and general relativity have not yet been reconciled into one general theory, so there is a fundamental difficulty with this melding of the two theories. Ellis is saying that even though we can’t observe the universe at that time when it was so small and temperatures were so high that quantum properties would have been significant, we can infer that this was the case theoretically, that is to say that there was a “Hot Big Bang” at the beginning of the universe with extremely high temperatures (energies)and an extremely small volume. The attempt to develop a fully adequate quantum gravity approach to cosmology is of course hampered by the lack of a fully adequate theory of quantum gravity, as well as by the problems at the foundation of quantum theory (the measurement problem, collapse of the wave function, etc.). The Hawking-Penrose Theorems also show that a class of solutions to the General Relativity equations have a singularity in the solution. The Borde-Guth-Vilenkin Theorem shows that under conditions of universe average expansion, there is a beginning point. Since all such solutions are non-applicable at the singularity because quantum gravity enters the picture, the relevance of such theorems is perhaps questionable. 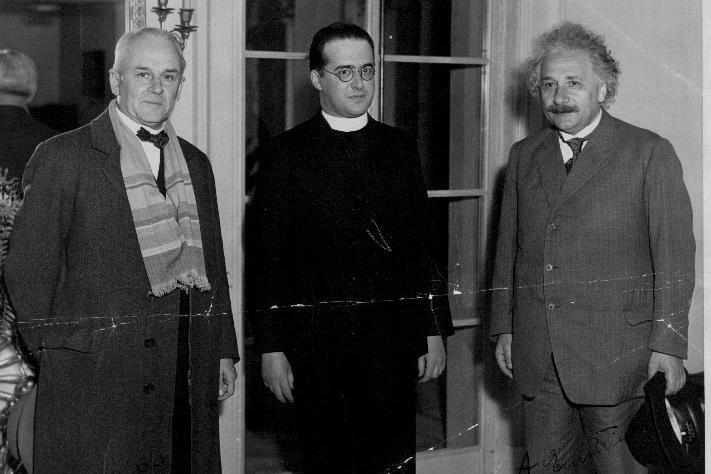 1Editor’s note: Georges LeMaitre was a Catholic priest and professor of physics. “He was the first known academic to propose the theory of the expansion of the Universe, widely misattributed to Edwin Hubble.” See also Stigler’s law of eponymy. But LemaÃ®tre is credited of being the first to propose a “big bang” origin of the universe, although he called it the â€œhypothesis of the primeval atomâ€ or the â€œCosmic Eggâ€. As we all know, the term “Big Bang” was coined by Fred Hoyle. My apologies for “shouting” (I’m not used to these tags). Thanks Johan for your comment, shouted or sotto voce,…and the reference. Hmmm. I think Millikan has a hat too, almost hidden. I know you like hats….